Cloud based solutions are all around us. Not only are we, on a personal level, moving our data from traditional storage on hard drives, limited to actual physical access, to easily accessible data on any computer or mobile device anywhere in the world, but also almost every industry is turning to cloud based solutions as a viable solution. Software as a Service (SaaS) offers many key benefits by giving users “on-demand” access to not only data, but even software ERP systems. A strong ERP system allows Supply Chain Management, Production Management, Financial Management, Sales Management, and even Planning and Scheduling to be managed efficiently. These systems are often times, not only diverse, but also complex, and require an immediate response when issues arise. By removing the need of having an in-house IT department, a company can cut cost, and confront issues anywhere in the world and at any time. The company can then focus on the core function as a manufacturer. With 40 years of experience, Epicor Software is known for delivering software solutions to the manufacturing, distribution, retail, and service industries. With an industry-specific focus with over 20,000 customers in over 150 countries, Epicor has provided “Ten Critical Questions Manufacturers Should Ask Before Choosing a Cloud-Based ERP Solution”. This white paper addresses many of the concerns companies should consider when deciding on moving their ERP systems into the modern cloud-based computing age. From determining if the solution supports your own manufacturing process, to addressing issues with a SaaS vendor, the information provided is essential to any one moving into cloud-based computing. Epicor’s next-generation business software solutions and history of providing tailor-made needs for manufacturing, distribution, retail, and other services, allow them to understand that a one-size-fit-all approach doesn’t necessarily always work. Their unique business layers approach allows even the smallest start-up metal fabricator to those larger multinational automotive distributors move their future into the clouds. 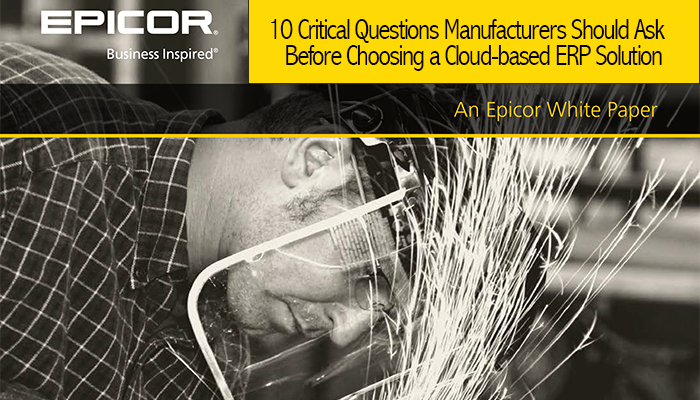 Download this white paper to learn the 10 questions to ask when considering a cloud-based ERP solution.